While vacationing, my wife and I regularly take long day hikes. You may know I am a stalwart supporter of LEO’s carrying a firearm at all times, so the backpack I wear has to have good concealment and easy access for a handgun. 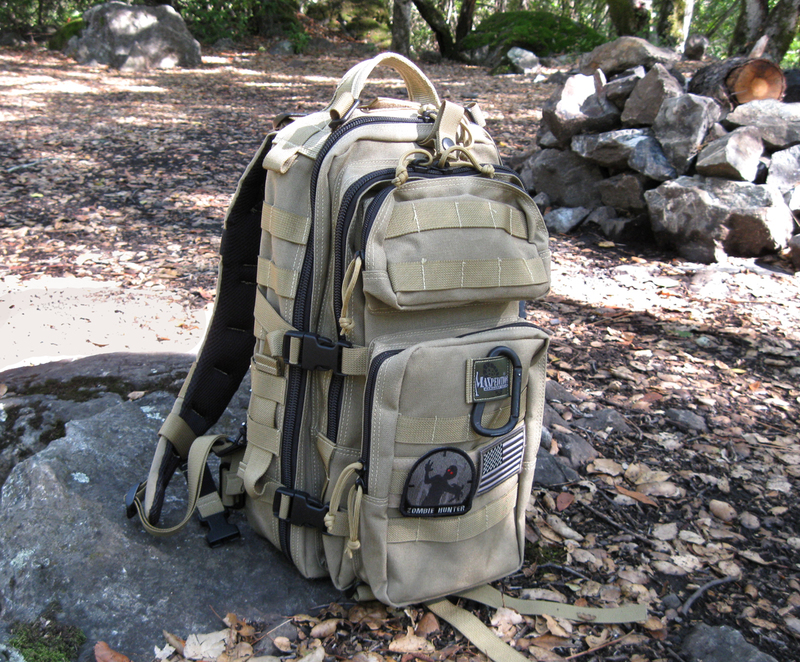 The Maxpedition Falcon II satisfies both attributes and more. Many backpacks and slingbags have adequate cargo space and useful features, but I went looking for a carry-all that could give me good ingress into a handgun compartment while the pack was worn on my back with both straps shouldered. In other words, a quick draw without having to doff the bag. Years ago, I purchased a Maxpedition Condor backpack. In those days, the Condor did not have a rear hydration/concealed carry pouch. However, I did like the Condor’s construction and sturdy materials. Based on this, I started to look at other Maxpedition products. The Falcon II had a zippered pocket that is accessible from the right rear side–Bingo! This looked promising. I received the Falcon II from an online retailer for a little over $100. I tore open the box and put it on straightaway. I could grab the right side rear pocket zipper at the base of the right strap and open the pocket. Without much effort, I could insert my hand into where the gun would go. Nice. As shown below, take extreme care and practice safe firearms handling when drawing a gun from this location. My finger is off the trigger and the gun is canted away from my back. The draw is similar to a small of the back holster presentation. (thanks, QK). There is loop Velcro in two large strips on the left side of the pocket’s interior and a loop field on the right side, against the wearer’s back. This is perfect for mounting either Maxpedition’s handgun holder or another similar hook and loop product. Though I bought a Maxpedition slip holder, I also have a 5.11 handgun holster, which has a thumb break for better retention. Because the thumb break the 5.11 is a little difficult to operate behind the back and in a loaded backpack, I normally use the Maxpedition holster. Fitted properly, it holds the gun securely muzzle down . When I wear this pack hiking, I usually have it loaded down with a 72 ounce hydration bladder in the large middle pocket, emergency medical supplies, two compasses, 550 cord, cellphone, small flashlight, multi-tool, firestarter, and other sundries in all the other pockets. I know, the pack is a bit heavy for a dayhike. Screw it, I may need these things for me and the missus, or anyone else who needs a little help. As a function of the load-out weight, the Falcon II rides heavily on my back. Even with a Glock 23 and spare mag in the rear pocket, the gun does not dig into my spine because of the backpack’s generous padding. The G23 is the largest handgun I will carry on a hike, and usually, it will be my Glock 27 or Kahr PM9. I used to carry a Smith & Wesson J-frame on hikes until one time that we were several miles down a remote wooded trail and heard angry voices ahead. Apparently, we were about a hundred yards from a drunken gathering of Southern less-than-Gentlemen. I did not feel very good about having my wife with me and only a Snubbie and a Speedstrip. I suggested we backtrack and avoid a confrontation. It sounded that bad. My hiking gun is for personal protection from two-legged critters, but one could easily carry a camp gun or bear-dissuader in the Falcon II’s big rear pocket. When I am traveling, I am usually constrained to a single handgun, since I do not want to go through too many hassles at airports here and afar, despite LEOSA. There are many other reviews of the “normal” features of the Falcon II, so I will just say that mine has been a good concealed carry companion in my walking travels from Florida to California. 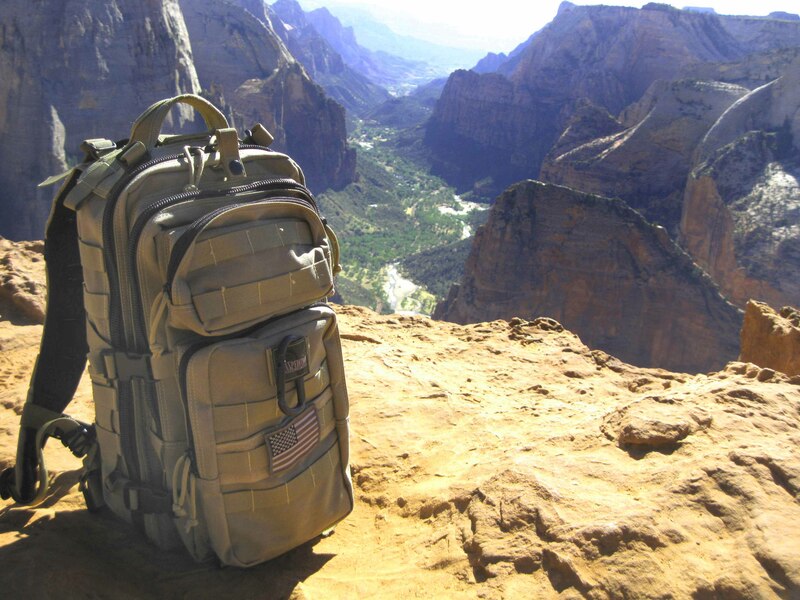 This entry was posted in Concealed Carry, Off Duty, Tactical Bags and tagged Backpack, Concealed Firearms Carry, Daypack, Falcon II, Hiking, Maxpedition. Bookmark the permalink. I used to have one of those, but I found it too narrow, and it stuck out too much for my liking. Have you found it to stick out father than other backpacks? Back when it started, I hopped on the sling-bag bandwagon for awhile, but quickly realized how much more I prefer a full two-strap pack. I have a North Face Yavapai, that I’ve had for almost 20 yrs, and it still runs great, I’ve been thinking about modding it to make it more EDC friendly. Picked up a Kodiak (larger version of the Sikta), but I find myself using my Camelbak BFM more. What’s your opinion of the Sling-Bag? Maxpedition or otherwise. I actually bought a Maxpedition Sitka expressly for carrying my writer’s gear at SHOT Show this year. I like a two strap bag for outdoor hiking because it is more stable, but the sling bag worked just great at SHOT and for some daily carry. The Sitka was great for rotating it around in front of me to get at notepads, cameras, batteries, and my iPad2. I was actually wondering if I should have bought a Kodiak for the added carry space. Do you find that one to be unwieldy when trying to access the pockets? Thank you for the review. I purchased the Kodiak wanting the larger space in order to carry a laptop as well as everything else you mentioned. I love the “sling-bag” idea, however when it is fully loaded I find it VERY uncomfortable to carry long distances. The single strap doesn’t offer the proper support for that kind of load out. I am looking to sell/trade if you are interested. I bought this bag after reading your review (and a few others), yours was the best and one of the only ones that included info on the CCW aspect of this bag. So far so good with the bag so far, just wanted to thank you for a great review! Thanks, Matt! I have found my Falcon II and Sitka packs to be rugged and useful. Thanks for your review. I had no idea this pack was suited to CCW. I have been looking for a good day pack/get home bag that would have that option. I already have the Max velcro holster and mag pouch that I use with their MPB-XXL. It works great for that application. I once had that bag checked by a security guard and he missed my loaded Rugar P89 and 2 extra 15 round mags. Could you use a smaller water bladder in that same pouch and have it stay out of the way of your weapon? I suppose you could split the CCW/Bladder compartment, but I would be a bit concerned with complicating the draw of a firearm with a plastic bag of water flopping around in there. Less important, hydration bladders sweat and I would not want all that liquid in such close contact with my gun and ammo for any length of time. 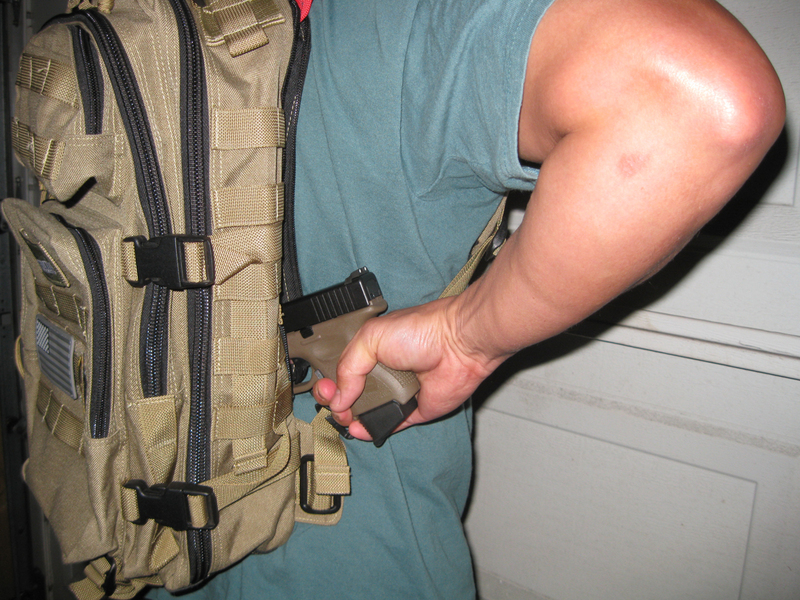 You could always MOLLE-up an external bottle carrier and let the gun/holster ride alone inside. Will you please tell me if you can also draw left-handed and your thoughts on its compatibility for a left-handed shooter? Unfortunately, this pack will not work for lefties, since the zipper opening is only on one side. 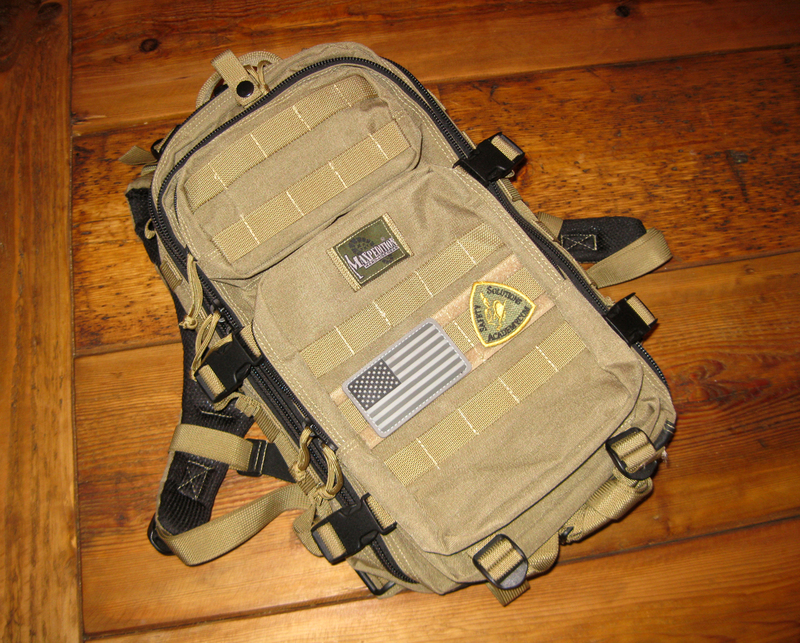 Maxpedition makes ambidextrous sling bags, as well as right and left-specific models (Sitka, Kodiak…). Randall, thanks for getting back to me so quickly. I really dislike sling bags personally. I like the the idea of being able to move the whole bag in front of you quickly but find wearing them uncomfortable. No problem, Todd. 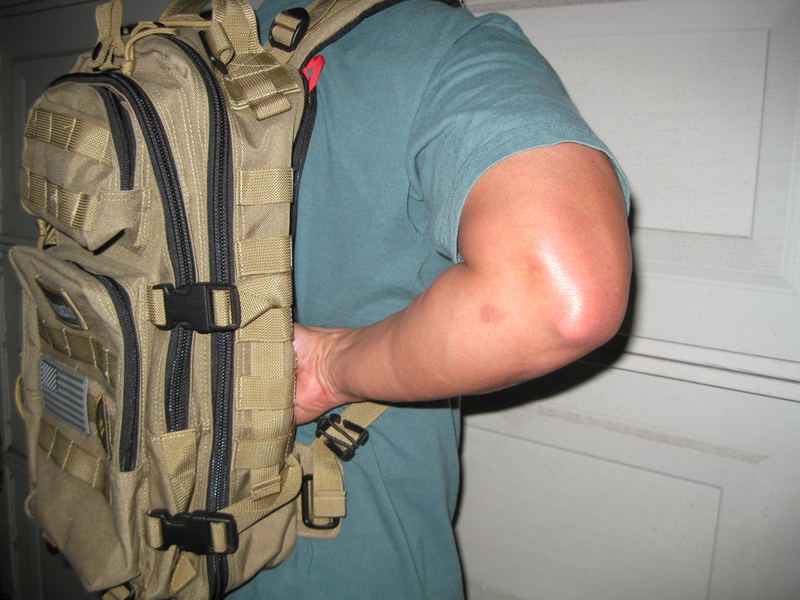 I find slingbags distribute the weight of the load disproportionately, so if you are carrying a heavy burden, they make for neck and shoulder pain. I reserve my Sitka for lighter equipment that I want to access easily–such as camera gear. Thanks Randall for a great review. I’ve been searching for days none stop to find a decent CCW bag that I can take on a day hike/overnighter. As soon as I read this and saw the detailed pictures I immediately knew this was what I was looking for. Thanks for being just about the only guy online to post any type of “practical” CCW style back pack. I’m buying on tonight! Are there any down sides/negatives to this bag? I love mine. No downsides here. The stitching is rugged and the design useful. I hope you enjoy yours! Thanks for reading. Maxpedition changed the color schemes a few years ago. Mine was purchased in early 2012. They’ve added some cool colors since then, though. Randall, Thanks so much for a comprehensive and highly informative review! I was having a really hard time finding a good CCW backpack that wasn’t a slingbag. Thanks to your review I finally have! I ordered it today from Amazon. Thanks again! Dorian, I hope it works out well for you. Mine has lots of mileage and has held up like a champ. I want a pack that conceals just like this. But two things! Anyone know of anything like this that is more sports oriented? I found this site, http://www.sportcarry.com but it looks like they are just getting started. I recently came across this review while doing a search for ccw backpacks. This was very helpful, thanks for taking the time to post it. 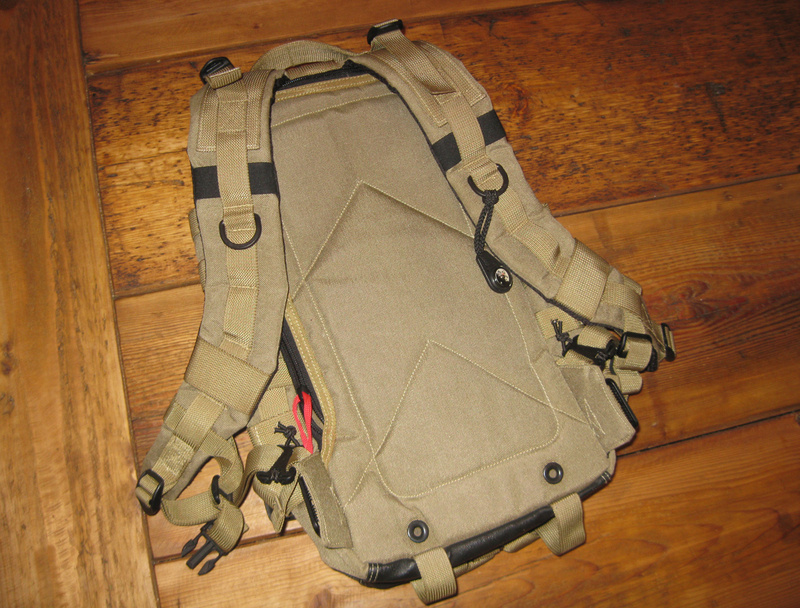 Years ago, I had the odd triangular shaped sling pack that Maxpedition makes (Monsoon, it think). 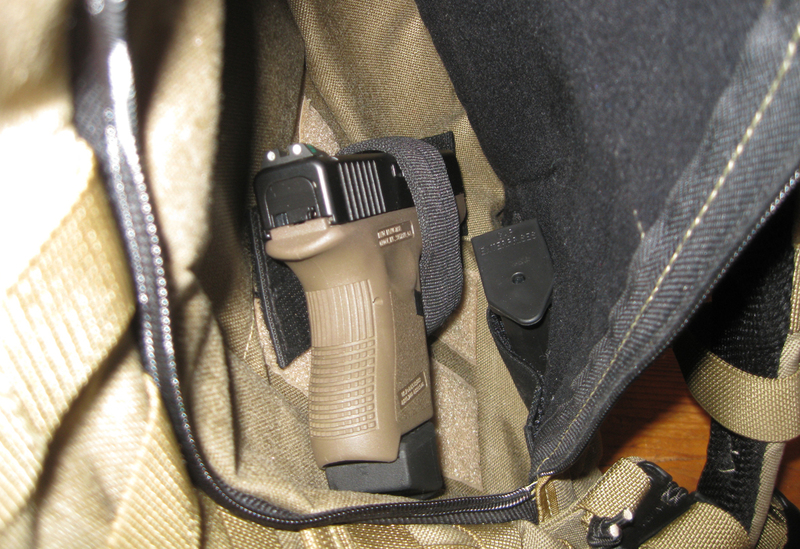 On that model, the back ccw compartment was also accessible while the pack was on the back. That was the only thing I liked about it, just not a believer in sling packs being very functional. I replaced that with a Vanquest Trident 20, which is a really nice pack, but the ccw compartment isn’t accessible without unhooking the right shoulder strap and swinging the bag in front of you. I recently started on another search for a better ccw pack, when I came across this article. There are a lot of really nice packs available on the market, few with ccw in mind, and all of those require bringing the pack to the front. Not very subtle, if the weapon is ever needed. I’ve ordered the Falcon 2 and I’m going to try it out. Thanks again, for addressing this topic. It’s literally the only information I found to address the issue and offer a solution. Don’t give up, Michael! There’s one that’s right for you out there.